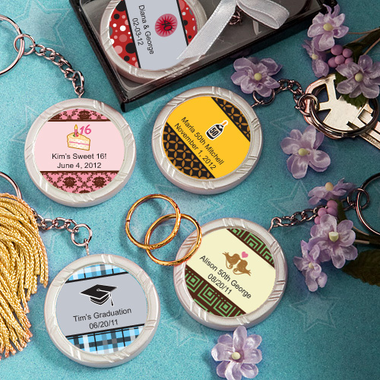 Unique, practical and affordable describes this graduation keychain. Each measures 5" x 1 ?"" and has a silver metal chain and ring attached to a round white poly resin charm with a grooved pattern rim and an inset center fit for easy application of the personalized peel and stick label of your choice. These make great graduation party favors! Each comes packaged in a clear topped box with a black base and silver insert, finished with an attached white satin bow. Please allow 3-4 days for production.